This page covers lighthouses of Russia's far northeast: the regions of Kamchatka and Magadan. Kamchatka Krai (territory) is a volcanic peninsula separating the Sea of Okhotsk from the Pacific, and Magadan Oblast (province) is on the north shore of the Sea of Okhotsk. Russian occupation of this area began with the explorations of Vitus Bering and Alexsei Chirikov between 1728 and 1741, and the town of Petropavlovsk-Kamchatsky was founded in 1740. However, there was limited development or commerce before the Soviet era. Magadan city was founded in 1929 to provide a port for the Kolyma gold-mining district to the north; it now has nearly 100,000 inhabitants. Petropavlovsk was expanded greatly to serve as a naval base for the Soviet Pacific Fleet; it has shrunk in recent years as many military installations were closed, but it still has nearly 200,000 inhabitants. During the Soviet period few foreigners were able to visit Russia's Pacific ports, and even today tourism in the Russian far east is slight. As a result, no photos are available for many of the lighthouses. If you have or can locate additional photos, please let me know. Russian lighthouses are owned and operated by the Russian Navy, although some of them have civilian keepers. The Russian word for a lighthouse is mayak (маяк); mys is a cape, ostrov is an island, and buhkta or zaliv is a bay. ARLHS numbers are from the ARLHS World List of Lights. Admiralty numbers are from volume M of the Admiralty List of Lights & Fog Signals. U.S. NGA List numbers are from Publication 112. This site has historical information on the major lighthouses. 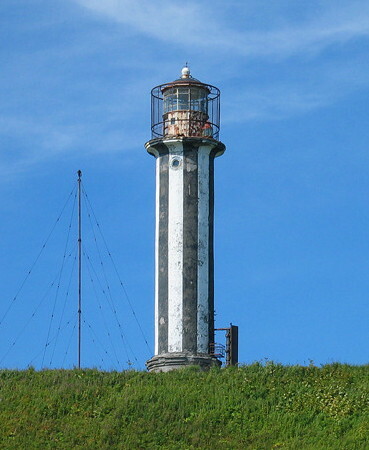 This Russian-language site has photos and information on several lighthouses of the area. Postcard views of historic Russian lighthouses posted by Klaus Huelse. Note: Koryakia, the former Koryak Autonomous Okrug, was merged into Kamchatka Krai in 2007. This very remote district has a population of only about 25,000. The coastal lights in this area have been mostly listed as "temporarily extinguished" by the Admiralty, and it is likely that most if not all of them have been abandoned. Date unknown. Active (? ); focal plane 119 m (390 ft); two white flashes every 4 s. 8 m (26 ft) round stone tower painted black. No photo available, and Google has only a distant satellite view of the area. Located on a headland on the south side of the entrance to Bukhta Natalia. Site status unknown. Admiralty M8122.7. 1988. Active (? ); focal plane 141 m (463 ft); white flash every 12 s. 17 m (56 ft) octagonal stone tower painted with black and white horizontal bands. No photo available, but Bing has a satellite view. Located on a headland about 25 km (15 mi) northeast of Mys Irina. Site status unknown. Admiralty M8122.4. Date unknown. Active (? ); focal plane 28 m (92 ft); white flash every 4 s. 17 m (56 ft) octagonal stone tower painted red. No photo available, but Bing has a satellite view. Located on a headland about 6 km (10 mi) northwest of Mys Irina. Site status unknown. Admiralty M8122.2. Date unknown. Active (? ); focal plane and light characteristic unknown. Approx. 8 m (26 ft) tower, form unknown. No photo available, but Bing has a satellite view. Located at the entrance to Apuka, a Koryak village in the lee of Mys Irina. Site status unknown. Admiralty M8122. Date unknown. Active (? ); focal plane 40 m (131 ft); white flash every 5 s. 9 m (30 ft) round stone tower painted black with a white horizontal band. No photo available, and Google has only a distant satellite view of the area. Located on a headland on the south side of the entrance to Bukhta Lavrova, on the east side of the base of the Govena Peninsula. Site status unknown. Admiralty M8121.6. Date unknown. Active (? ); focal plane 30 m (98 ft); white flash every 4 s. 8 m (26 ft) round stone tower painted with black and white horizontal bands. No photo available, and Google has only a distant satellite view of the area. Located on a headland about 20 km (13 mi) southwest of the Bukhta Lavrova light. Site status unknown. Admiralty M8121.4. Date unknown. Active (? ); focal plane 72 m (236 ft); white flash every 8 s. 17 m (56 ft) octagonal stone tower painted with black and white horizontal bands. No photo available, and Google has only a distant satellite view of the area. Located on a headland about 16 km (10 mi) northeast of Mys Govena. Site status unknown. Admiralty M8129; NGA 15410. Date unknown. Inactive at least since 2009. 21 m (69 ft) square concrete tower, painted white with a black horizontal band. No photo available, but Bing has a satellite view. 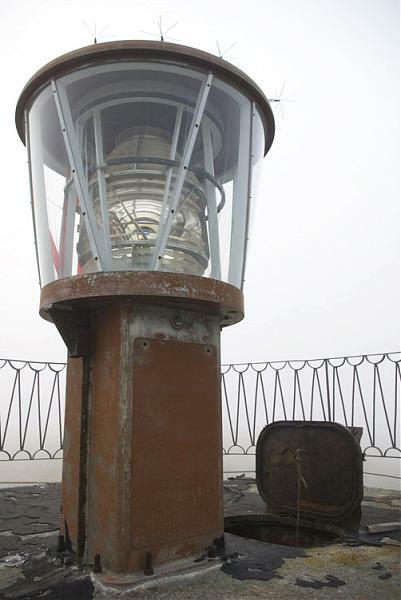 In 2009 the Admiralty reported this light had been abandoned. Located at the end of the Govena Peninsula, marking the eastern entrance to the Bay of Korfa. Site status unknown. ARLHS ASR-146. 2009 (?). Active; focal plane 73 m (240 ft); white light, 2 s on, 4 s off. 12 m (39 ft) square steel skeletal tower with gallery. No photo available. Located near the historic lighthouse. Site status unknown. Admiralty M8130; NGA 15412. Date unknown (?). Active; focal plane 62 m (203 ft); white light, 1.5 s on, 1.5 s off. 8 m (26 ft) octagonal cylindrical white concrete tower with a black vertical stripe. No photo available, but Google has a good satellite view. The name is misspelled Skrtyy by NGA. Perched on a hill at the head of the Bay of Korfa, just east of the base of the Kamchatka Peninsula. Accessible only by boat. Site open, tower closed. Admiralty M8128; NGA 15408. Date unknown (?). Active; focal plane 93 m (305 ft); white flash every 3 s. 11 m (36 ft) square skeletal tower carrying a slatted daymark painted yellow with a black vertical stripe. No photo available, but Bing has a distant satellite view. Located on the heights of Mys Oria, the western entrance to the Bay of Korfa. Site open, tower closed. Admiralty M8126; NGA 15416. Date unknown. Inactive. Approx. 10 m (33 ft) square masonry tower, formerly covered by a white concrete. Roman Bruehwiler's photo is at right, Andy Wolff has a distant view, and Google has a distant satellite view. Caroline Durre has a 2010 closeup; she found the lighthouse to be abandoned, although it is still listed as active (focal plane 75 m (426 ft); white flash every 4 s). Located on an island in the entrance to Koraginskiy Bay. Accessible only by boat. Site open, tower closed. Admiralty M8125; NGA 15420. Date unknown. Active (? ); focal plane 60 m (197 ft); red flash every 4 s. 8 m (26 ft) square concrete tower, painted black. No photo available, but Google has a satellite view. Located at the southeastern point of Il'pyr Island, which separates Anapka Bay from Uala Bay. (The island is connected tenuously to the mainland by a long sand and gravel spit, so it is also known as the Il'pyr Peninsula.) Site status unknown. Admiralty M8121. Date unknown. Active (? ); focal plane 24 m (79 ft); white light, 3 s on, 3 s off. 8 m (26 ft) round stone tower painted with black and white horizontal bands. No photo available, but Google has a distant satellite view. Located on a headland on the west side of Il'pyr Island, marking the east side of the entrance to Uala Bay. Site status unknown. Admiralty M8121.2. Date unknown. Active (? ); focal plane and light characteristic unknown. Approx. 10 m (33 ft) square concrete or masonry tower. No photo available, but Google has a satellite view. The Kosa Ossorskaya (Ossora Spit) is a long peninsula sheltering Ossora Bay. Located near the end of the spit. Site status unknown. Admiralty M8120.6. 1977. Active; focal plane 76 m (249 ft); two flashes every 15 s, white or red depending on direction. 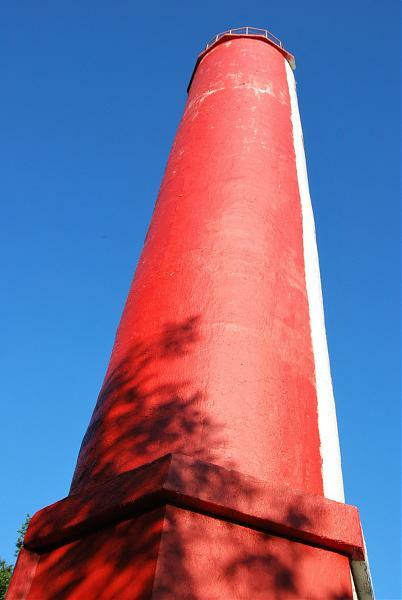 10 m (33 ft) octagonal cylindrical concrete tower painted with red and white horizontal bands. A photo is available, Wikimapia has a closeup of the lens, and Google has a satellite view. Karaginskiy is a substantial island, 101 km (63 mi) long and as much as 27 km (17 mi) wide, about 40 km (25 mi) off the northern neck of the Kamchatka Peninsula. It is uninhabited except for the light station, which had a keeper at the time of a 2009 expedition. Located near the southwestern tip of the island. Accessible only by boat. Site open, tower closed. Admiralty M8120.2. Date unknown. Active; focal plane 59 m (194 ft); white flash every 8 s. 25 m (82 ft) round concrete tower with lantern and gallery, painted with black and white vertical stripes. Victor Morozov has the closeup at the top of this page, and Google has a satellite view of the station. NGA misspells the name as Ozernoy. This lighthouse marks a cape at the northeastern corner of the Kamchatka Peninsula, far from any settlements. Site status unknown. ARLHS ASR-052; Admiralty M8120; NGA 15424. 1960 (station established 1933). Active; focal plane 38 m (125 ft); white light, 1.5 s on, 4.5 s off. 29 m (95 ft) round concrete tower with lantern and gallery, painted with black and white horizontal bands; lantern dome painted red. Victor Morozov's photo is at right, Wikimapia has an aerial photo, and Google has a satellite view of the station. The cape was named for the Russian Navy cruiser Afrika, which mapped this area during an 1882 hydrographic expedition. The original light was on a 10.5 m (34 ft) square wood pyramidal tower. Located on the eastern cape of a very prominent peninsula about 100 km (60 mi) east of Ust-Kamchatsk. Site status unknown. ARLHS ASR-009; Admiralty M8108; NGA 15428. Date unknown. Active (? ); focal plane 97 m (318 ft); white flash every 4 s. 10 m (33 ft) square cylindrical skeletal tower carrying two yellow trapezoidal daymarks on two opposite sides.No photo available, but Bing has an indistinct satellite view. Located atop a looming headland about 160 km (100 mi) west of Mys Afrika. Site status unknown. Admiralty M8104. 1962 (station established 1944). Active; focal plane 53 m (174 ft); three white flashes every 10 s. 13 m (43 ft) octagonal concrete tower with lantern and gallery, painted with black and white vertical stripes. Lightphotos.net has a closeup photo by Sergey A. Krasnoshchekov, another photo (fourth thumbnail) and a 1984 postage stamp image are available, Huelse has a historic postcard view, and Bing has a satellite view of the station. The station was established with a temporary wood tower to guide Soviet warships during World War II. Located on the southeastern tip of the Kronotsky Peninsula, a large protuberance on the east coast of Kamchatka that includes the Otdelnaya volcano. Site status unknown. ARLHS ASR-037; Admiralty M8102; NGA 15432. Date unknown. Active (? ); focal plane 38 m (125 ft); white flash every 3 s. 12 m (39 ft) square pyramidal wood tower carrying a white daymark with a red vertical stripe. A very distant photo of the station is available, and Google has a satellite view. Located on a sharp promontory about 300 km (185 mi) northeast of Petropavlovsk-Kamchatsky. Site status unknown. Admiralty M8098. 1964 (station established 1937). Active; focal plane 249 m (817 ft); white flash every 6 s. 12 m (39 ft) square masonry tower, painted with red and white horizontal bands, attached to a 1-story keeper's house. A photo is available, and Bing has a satellite view. The original lighthouse was a 12 m (39 ft) wood tower. Located on a very prominent cape about 80 km (50 mi) east of Petropavlovsk-Kamchatsky. Site status unknown. ARLHS ASR-061; Admiralty M8096; NGA 15440. Date unknown. Active (? ); focal plane and light characteristic unknown. Approx. 10 m (33 ft) masonry tower. The light is barely visible atop the ridge in Sydney Cruise Lines photo, and Google has a distant satellite view. Located near the tip of a sharp peninsula projecting into Morzhovaya Bay. Site status unknown. Admiralty M8085. Date unknown. Active; focal plane 62 m (203 ft); white flash every 3 s. 15 m (49 ft) round masonry tower painted white with a black or red horizontal band. No photo available, but Google has a distant satellite view. NGA describes a square skeletal tower. Located near the village of Polovinka about 25 km (15 mi) east of Petropavlovsk. Site appears open, tower closed. Admiralty M8076; NGA 15440.5. 1897 (station established 1850). Active; focal plane 93 m (305 ft); white light, 5 s on, 2 s off. 14 m (46 ft) round cast iron tower with lantern and galley, painted with black and white horizontal bands. Alexey Antipov's 2003 photo appears at right, Lightphotos.net has a good photo, Oleg Sikhfried has a closeup 2017 photo showing the lighthouse freshly painted, a historic photo is available, Aleksandr Yevgen'yevich Vyatkin has a distant street view, and Google has a satellite view. Founded by Vitus Bering in 1740 and named for his two ships Sv. Piotr (St. Peter) and Sv. Pavel (St. Paul), Petropavlovsk has a population of about 200,000 and is Russia's easternmost city. The light station is the oldest on Russia's Pacific coast; lights were displayed intermittantly from the earliest days of the settlement. This historic lighthouse replaced wood towers built in 1850 and 1886. Located on a promontory at the entrance to Avacha Bay, the city's spectacular harbor. Site open, tower closed. ARLHS ASR-055; Admiralty M8069; NGA 15441. Date unknown (recent). Active; focal plane and light characteristic unknown. Approx. 20 m (66 ft) concrete tower with lantern and gallery. No photo available, but Google has a satellite view. The lighthouse is not seen in a 2013 street view of the area. The range guides ships leaving the Petropavlovsk docks. The rear light is on a skeletal tower. Site status unknown. Admiralty M8073.155. Date unknown. Active; focal plane 56 m (184 ft); red light, 1.5 s on, 1.5 s off. 12 m (39 ft) round cylindrical concrete tower, painted red with a white vertical stripe. Wikimapia has a closeup photo, and Google has a street view through trees and a satellite view. Located on a hillside above the harbor of Petropavlosvsk. Site status unknown, but the tower should be visible from nearby streets. Admiralty M8073.2. Date unknown. Active; focal plane 83 m (272 ft); red light, 1.5 s on, 1.5 s off. 8 m (26 ft) round cylindrical concrete tower, painted red with a white vertical stripe. No photo available, but Google has a satellite view. Located about 80 m (265 ft) northeast of the front light. Site status unknown, but the tower should be visible from nearby streets. Admiralty M8073.21. Date unknown. Active; focal plane and light characteristic unknown. Approx. 15 m (49 ft) round barbell-shaped tower colored with black and white horizontal bands. No photo available, but Google has a satellite view. Located on a promontory on the west side of Avacha Bay. Site status unknown. Admiralty M8072.2. Date unknown. Active; focal plane and light characteristic unknown. Approx. 15 m (49 ft) square cylindrical skeletal tower. No photo available, but Google has a satellite view. Located on a promontory on the southwest side of Avacha Bay. Site status unknown. Admiralty M8071. 1961 (station established 1954). Active; focal plane 104 m (341 ft); white light, 4.5 s on, 7.5 s off). 8 m (26 ft) octagonal cylindrical concrete tower, painted white, with a small red lantern. A distant view is available, the light is barely visible atop the cape in a photo by Vyacheslav Vertyanov, and Bing has a satellite view. Located on a promontory on the west side of the entrance to Avacha Bay, opposite the Petropavlovsk lighthouse. Site open, tower closed. Admiralty M8070.5; NGA 15441.3. Date unknown. Active; focal plane 161 m (528 ft); white flash every 4 s. 6 m (20 ft) skeletal tower. No photo available, although Alexey Antipov has the view from the lighthouse, and Google has a satellite view. Located atop a steep-sided island about 13 km (8 mi) south of the entrance to Avacha Bay and Petropavlovsk. Site status unknown. ARLHS ASR-084; Admiralty M8068; NGA 15441.6. Date unknown. 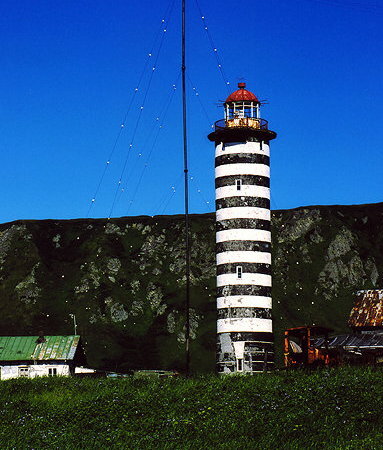 Active; focal plane 171 m (561 ft); white flash every 6 s. 10 m (33 ft) square skeletal tower carrying a daymark painted with red and white horizontal bands. No photo available, but Google has a satellite view. Located on a very steep cape about 25 km (15 mi) south of Petropavlovsk. Site status unknown. Admiralty M8067; NGA 15442. Date unknown. Active; focal plane 61 m (200 ft); white flash every 4.5 s. 8 m (26 ft) octagonal concrete tower, painted with black and white horizontal bands. No photo available, but Google has a satellite view. Located on a promontory about 25 km (15 mi) south of Petropavlovsk. Site status unknown. Admiralty M8066; NGA 15442.5. Date unknown. Active; focal plane 181 m (594 ft); white flash every 4 s. 8 m (26 ft) square pyramidal skeletal tower. No photo available; a Google satellite view probably shows the station. Located on a cape about 65 km (41 mi) south of Petropavlovsk. Site status unknown. Admiralty M8065; NGA 15442.7. Date unknown. Active; focal plane 143 m (469 ft); two white flashes every 10 s. 16 m (52 ft) octagonal tower, painted with black and white horizontal bands. 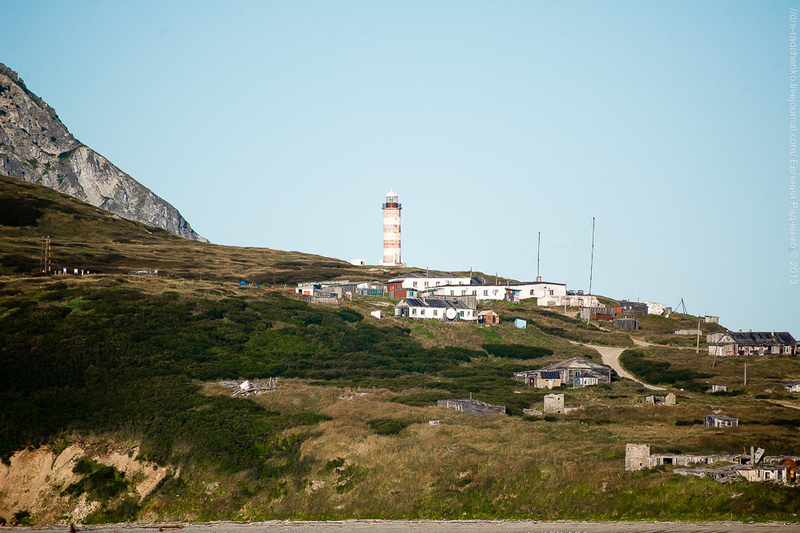 A recent photo shows a dilapidated lighthouse, and Bing has a satellite view of the tower. Located on a promontory in a remote area of Kamchatka's southeast coast, about 100 km (60 mi) south of Petropavlovsk-Kamchatsky. Site status unknown. ARLHS ASR-038; Admiralty M8064; NGA 15516. 1968 (station established 1933). Active; focal plane 69 m (226 ft); white light, 3 s on, 4 s off. 3 s on, 5 s off. 29 m (95 ft) round cylindrical concrete block tower with gallery and a small lantern. 1-story keeper's house. Tower painted with red and white horizontal bands. A 1999 photo and a 2007 photo both show a dilapidated and weatherbeaten station, Lightphotos.net has a distant view, another distant view is also available, and Google has a satellite view of the station. The original light was on an 8 m (26 ft) pyramidal wood tower. This was replaced in 1957 by a 23.5 m (77 ft) cast iron tower.Located on heights about 3.5 km (2 mi) north of the extreme southern tip of the Kamchatka Peninsula, which is considered to be one of the windiest places in the world. Accessible only by boat or float plane. Site status unknown. ARLHS ASR-043; Admiralty M8063; NGA 15525. Date unknown. Active; focal plane 56 m (184 ft); one long (1.5 s) red flash every 6 s. 6 m (20 ft) metal tower. The tower carries a rectangular daymark painted red with a white vertical stripe. No photo available, but Bing has a satellite view of the station. Located at the village of Ozernovskiy on the southwestern coast of Kamchatka. Site status unknown. ARLHS ASR-052; Admiralty M8038; NGA 15528. 1956 (station established 1944). Active; focal plane 35 m (115 ft); white light, 1.5 s on, 4.5 s off. 25 m (82 ft) iron (?) tower, painted with black and white horizontal bands. Alexey Antipov's distant view is at right, Lightphotos.net has a view from the sea, and Google has a satellite view. A 13.5 m (44 ft) wood daybeacon was built here in 1908. The 1944 lighthouse was a 19 m (62 ft) triangular pyramidal wood tower. 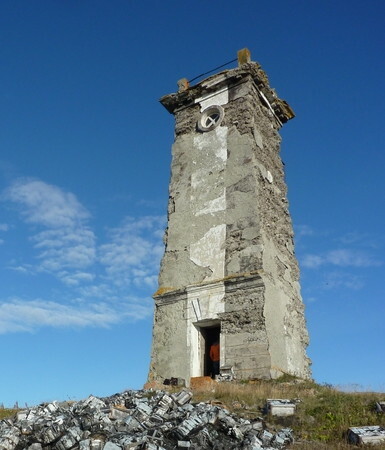 The lighthouse is actually located at Zuykovo, about 16 km (10 mi) south of the Oktyabr’skiy settlement on the west side of the Kamchatka Peninsula about 150 km (95 mi) north of Cape Lopatka. Site status unknown. ARLHS ASR-154; Admiralty M8036; NGA 15532. Date unknown. Active; focal plane 18 m (59 ft); white flash every 4 s. 12 m (39 ft) octagonal cylindrical concrete tower painted red. No photo available, but Bing has a satellite view. Located at the entrance to the Kikhchik River, about 100 km (60 mi) north of Oktyabr'skiy. Site status unknown. Admiralty M8034. 1967 (station established 1937). 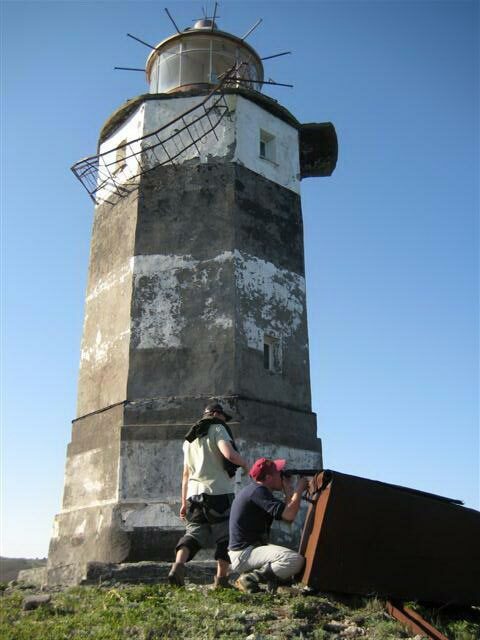 Active; focal plane 80 m (262 ft); three white flashes every 15 s. 34 m (112 ft) round tower with lantern and gallery. Upper half of the tower painted black, lower half white. No photo available, but Bing has a satellite view of the station. This lighthouse marks the westernmost bulge of the Kamchatka Peninsula. The original light was on a 13 m (43 ft) pyramidal wood tower; this was replaced in 1957 by a 12 m (39 ft) skeletal tower. Located in a very remote area on the west side of the peninsula, near the mouth of Krutugorova River. Site status unknown. ARLHS ASR-039; Admiralty M8030; NGA 15552. Date unknown. Probably inactive; listed with focal plane 16 m (52 ft); white flash every 7.5 s. 10 m (33 ft) octagonal cylindrical concrete tower painted with black and white horizontal bands. No photo available, but Bing has a satellite view. Located on the south side of the entrance to the Tigil' River on the northwest coast of the Kamchatka Peninsula. Site status unknown. Admiralty M8029. 1958. Active; focal plane 58 m (190 ft); white light, 3 s on, 4.5 s off. 19 m (62 ft) octagonal cylindrical concrete tower with lantern and gallery, painted with black and white horizontal bands. Several 1-story station buildings. Bing has a satellite view of the station. Located on a promontory at the southwestern tip of the Koni Peninsula, marking the eastern entrance to the Tauyskaya Gulf, which leads to Magadan. Site status unknown. ARLHS ASR-011; Admiralty M8021; NGA 15560. Date unknown. Active; focal plane approx. 40 m (131 ft); three white flashes every 15 s. Approx. 15 m (49 ft) octagonal cylindrical concrete tower with lantern and gallery, painted with red and white horizontal bands. 5th order Fresnel lens. Several 1-story station buildings. Lightphotos.net has a photo and a closeup by Sergey Karpukhin, a 2009 view from the sea (1/3 the way down the page), and Bing has a satellite view of the station. Note: There is another Mys Taran lighthouse in Kaliningrad on the Baltic Sea. Located on a very sharp cape at the northwestern tip of the Koni Peninsula. Site status unknown. Admiralty M8015; NGA 15561. Date unknown. Active; focal plane 217 m (712 ft); white flash every 3 s. 6 m (20 ft) octagonal cylindrical concrete tower painted white. No photo available, but Google has a satellite view. Zavyalova is an island about 25 km (15 mi) long and 8 km (5 mi) wide located about 18 km (11 mi) west of Mys Taran. Located on the southwestern tip of Zavyalova Island. Accessible only by boat. Site status unknown. Admiralty M8010; NGA 15561.1. Date unknown. Active; focal plane 35 m (115 ft); white flash every 4 s. 6 m (20 ft) octagonal cylindrical concrete tower painted white. No photo available, but Google has a satellite view. Zavyalova is an island about 25 km (15 mi) long and 8 km (5 mi) wide located about 18 km (11 mi) west of Mys Taran. Located on a promontory on the north coast of Zavyalova Island. Accessible only by boat. Site status unknown. Admiralty M8010.5; NGA 15561.12. Date unknown. Active; focal plane 14 m (46 ft); red flash every 3 s. 12 m (39 ft) square cylindrical skeletal tower carrying a daymark painted with black and white horizontal bands. No photo available, but Bing has a satellite view. Located on an island in the approach to Ola, a town about 25 km (15 mi) east of Magadan. Accessible only by boat. Site open, tower closed. Admiralty M8013; NGA 15561.4. 1957. 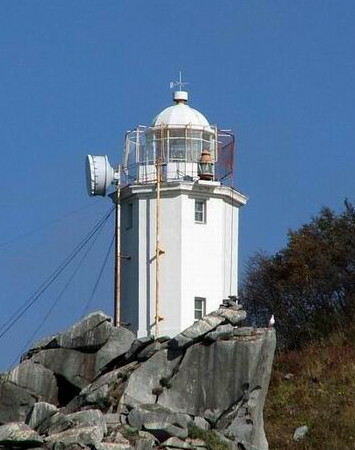 Active; focal plane 74 m (243 ft); white flash every 7.5 s. 14 m (46 ft) octagonal cylindrical tower with lantern and gallery. Entire lighthouse painted white. A photo is at right, and Google has a satellite view. 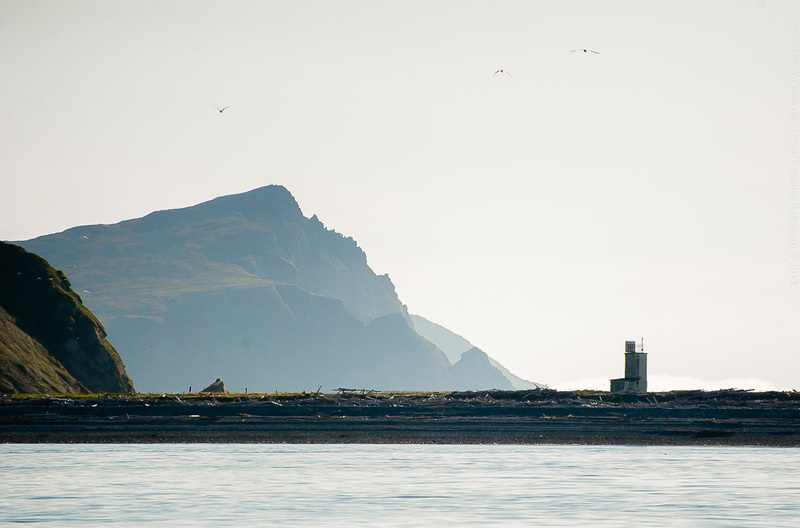 This lighthouse stands at the end of the Staritskiy Peninsula marking the south side of the entrance to the Bukhta Nagayeva and Magadan; another photo showing this beautiful site is available. Located about 30 km (19 mi) west southwest of Magadan. Site status unknown; there appears to be road access to the station. ARLHS ARS-142; Admiralty M8011; NGA 15562. Date unknown. Active; focal plane 15 m (49 ft); continuous red light. 15 m (49 ft) octagonal masonry tower with gallery, attached to a 1-story equipment building. Lighthouse painted white with a black vertical stripe on the front face. A photo is at right, Evgeny Gutarev has a photo, and Google has a street view and a satellite view. Founded in 1929 and built initially by convict labor, Magadan is the only town of any size in the province and one of the most isolated cities of the world. 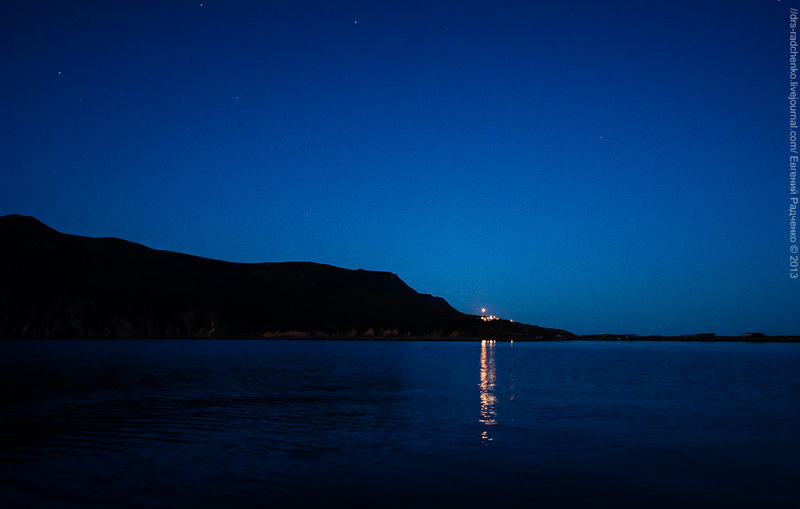 The city is located at the head of the Bukhta Nagayeva, a fjord-like bay, and this light is the front light of the range that guides ships up the bay to the harbor. Located on the shore of the bay just to the west of the city. Site appears open, tower closed. ARLHS ARS-141; Admiralty M8012; NGA 15562.2. Date unknown. Active; focal plane 43 m (141 ft); continuous red light. 14 m (46 ft) square concrete tower with gallery. Lighthouse painted white with a black vertical stripe on the front face. Lightphotos.net has a photo, Vitalia Cornoby has a closeup photo, and Google has a street view and a good satellite view. Located 400 m (1/4 mi) east northeast of the front light, in an area of tall apartment towers. Site presumably open, tower closed. Admiralty M8012.1; NGA 15562.21. 1958. Active; focal plane 87 m (285 ft); white light, 3 s on, 9 s off. 20 m (66 ft) round cylindrcial concrete tower painted with red and white horizontal bands. A photo and a distant view are available, Yevgeniy Radchenko has a distant view showing the lighthouse in action, and Google has a satellite view. Spafaryeva Island is at the western entrance to the Tauyskaya Gulf, which leads to Magadan. 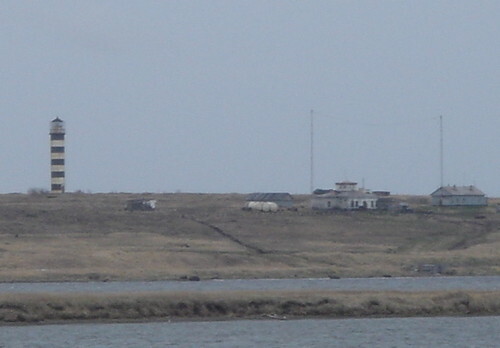 The miltary base on the island is closed, but the settlement at the lighthouse houses the staffs of the light station and weather station. Located on the south coast of the island. Site status unknown. ARLHS ARS-155; Admiralty M8009; NGA 15564. Date unknown. Active; focal plane 12 m (39 ft); white flash every 3 s. 6 m (20 ft) octagonal cylindrical concrete tower painted white. A photo is available, and Google has a satellite view. Located on a spit at the northwestern corner of Spafaryeva Island. Site status unknown. Admiralty M8009.5; NGA 15564.1. Posted May 19, 2006. Checked and revised May 9, 2018. Lighthouses: 52. Site copyright 2018 Russ Rowlett and the University of North Carolina at Chapel Hill.